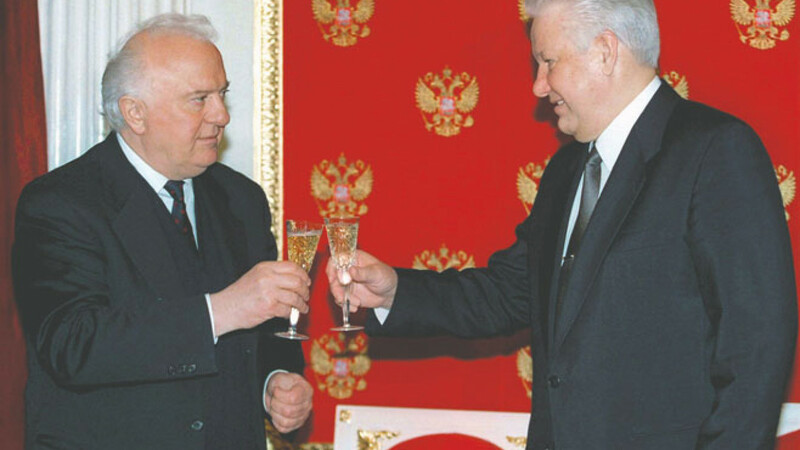 Former Georgian President Eduard Shevardnadze, left, seen here with his Russian counterpart Boris Yeltsin in the Kremlin in 1996, died Monday. Eduard Shevardnadze, the Soviet Union's last foreign minister who later served as Georgian president, died Monday at the age of 86, sparking a collective assessment of the mixed legacy that he left to both Russia and his native Georgia. Shevardnadze's death following a long illness was confirmed by his personal assistant and elicited a wave of condolences from current and former Russian authorities who paid tribute to his role in opening the Soviet Union to the world. Shevardnadze, who served as foreign minister under Soviet leader Mikhail Gorbachev from 1985 to 1990 and then again in 1991, orchestrated the diplomatic aspect of the Soviet Union's liberalizing policies of glasnost and perestroika that are viewed by some as having precipitated the collapse of the Soviet Union and were resisted by the more conservative members of Soviet bureaucracy. Following the collapse of the Soviet Union, Shevardnadze became the Georgian head of state in 1992 and remained president of the country until 2003, when he was ousted by the peaceful Rose Revolution that saw Mikheil Saakashvili brought to power following widespread protests over rigged parliamentary elections, government corruption and a failing economy. Gorbachev, who called Shevardnadze his friend, said Monday that he had made "an important contribution to the foreign policy of perestroika and was an ardent supporter of new thinking in world affairs," Interfax reported. The former Soviet leader also underlined Shevardnadze's role in putting an end to the Cold War nuclear arms race. President Vladimir Putin expressed his "deep condolences to [Shevardnadze's] relatives and loved ones, and to all the people of Georgia," his spokesman Dmitry Peskov said. Russia's Foreign Ministry also issued a statement on Shevardnadze's passing, saying the former Georgian leader had been "directly involved in social and historical processes on a global scale." In the West, Shevardnadze — affectionately known as "Shevy" — is also recognized for having helped end the Cold War, including through assisting in negotiations that amounted to the reunification of Germany in 1990, a development Soviet bureaucracy had long opposed. But Shevardnadze's role in masterminding policies that analysts say precipitated the demise of the Soviet Union have left the more nostalgic portions of the Russian population with mixed feelings, according to Alexander Mikhailenko, a professor of Russian foreign policy at Russia's Presidential Academy of National Economy and Public Administration. "Shevardnadze played an important role in perestroika, which led to him being partially blamed for the collapse of the Soviet Union," Mikhailenko said. "He is remembered as one of those who brought the system down. In retrospect, some people will appreciate his role in this process. Others will continue to condemn him and Gorbachev for this." In the early years of Georgia's post-Soviet transition, Shevardnadze played a key role in laying the foundations of today's fractious Russian-Georgian relations by setting a policy of looking West, according to analysts. Shevardnadze's desire to forge closer ties with European and transatlantic institutions — an issue that has remained a bone of contention with Russia — continues to impact Russian-Georgian relations to this day, said George Mchedlishvili, associate professor at the University of Georgia's school of social sciences. "It was Shevardnadze who turned Georgia firmly toward the West," Mchedlishvili said. "He played an essential role in getting the country into the Council of Europe two years before Armenia and Azerbaijan. These aspirations led Russia to threaten Georgia in different ways." When Georgia was admitted to the Council of Europe in 1999, Shevardnadze said that the country's closer ties to Europe would "help solve the problems bequeathed by the fratricidal conflicts," referring to the clashes in Georgia's breakaway regions of South Ossetia and Abkhazia. Shevardnadze's administration also pledged to pursue closer relations with the EU and NATO. Analysts said Shevardnadze fared well in adverse conditions, balancing the demands of a population in precarious economic conditions, the outbreak of civil conflicts in South Ossetia and Abkhazia, and the inexorable nature of the country's ties to Russia. "Of course Shevardnadze was forced to make concessions to Russia early on after the collapse of the Soviet Union, including joining the Commonwealth of Independent States, because his political hand was weak," Mchedlishvili said. "Given all the adversities he faced, including a collapsing economy, internal conflicts and spats with Russia, undeniable progress was made in Georgia during his presidency." But Russian policy circles and some sections of the Georgian population view Shevardnadze's presidency in the stormy days of Georgia's post-Soviet transition in a more negative light. "Shevardnadze gets mixed reviews from Russians because although he contributed to stabilizing the country, he is not viewed as having been able to de-escalate tensions in South Ossetia and Abkhazia, or as having respected the interests of the Georgian people," Mikhailenko said. "Some think that he did not do all he could have done to stabilize the situation and that he could have prevented relinquishing power to Saakashvili, who adopted harsher positions toward Russia." Georgian social media was buzzing following the former president's death, with popular reactions ranging from genuine mourning to phrases such as "may he rest in hell," according to Mchedlishvili. "Shevardnadze came to power at a time when you could not talk about the state of Georgia," Mchedlishvili said. "Paramilitaries were roaming the streets, people were being robbed, there were conflicts in Abkhazia and South Ossetia and the economy was on the brink of collapse. But at the end of Shevardnadze's presidency in 2003, you could talk about a Georgian state, albeit a weak one. He contributed greatly to the formation of the state of Georgia, but also to its corruptness and inefficiency." Shevardnadze will be laid to rest on Sunday in the Georgian capital of Tbilisi, ITAR-Tass reported. Gorbachev will not attend the funeral because of health problems, Russian media outlets reported.